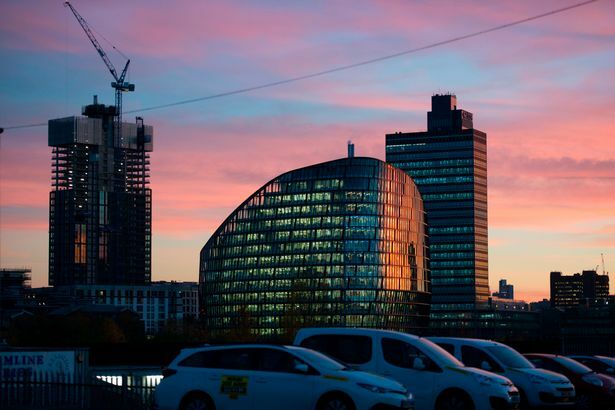 Manchester city centre’s extraordinary pace of development is striking right now even if you see it on a daily basis – and all the more remarkable if you’re not a regular visitor. The cranes that have gathered on the skyline since development first recovered from the 2008 crash are continuing to multiply, as planning permission is continually granted for a vast range of new projects. 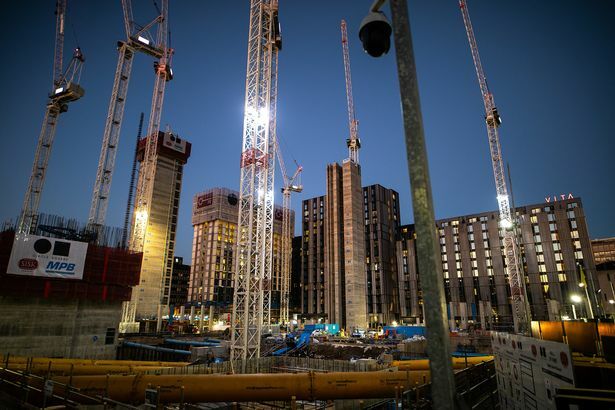 Some of the buildings under construction are set to eclipse anything outside of London in terms of scale, as the council looks to boost Manchester’s economy and add to the city’s market-rate housing supply. But what exactly will the cranes leave behind, once development is complete? 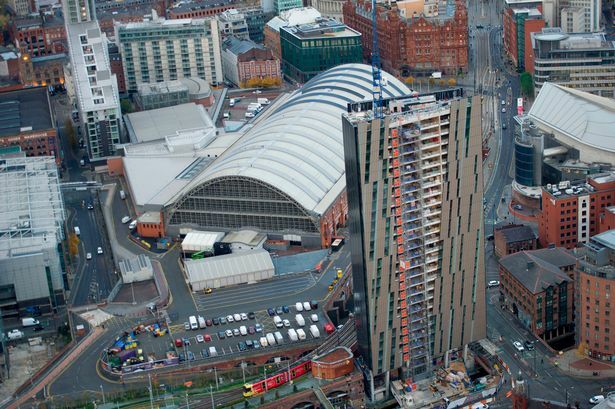 Here we give you the run-down on the key projects fuelling Manchester’s ongoing construction boom. 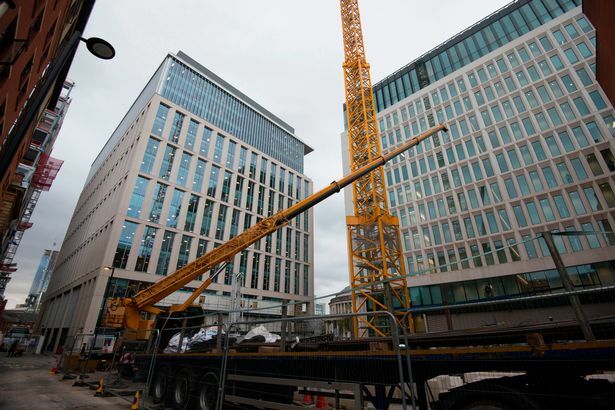 One of the biggest clusters of cranes currently dominating Manchester city centre’s horizon belongs to the huge, decade-long development taking place at the former BBC site on Oxford Road. 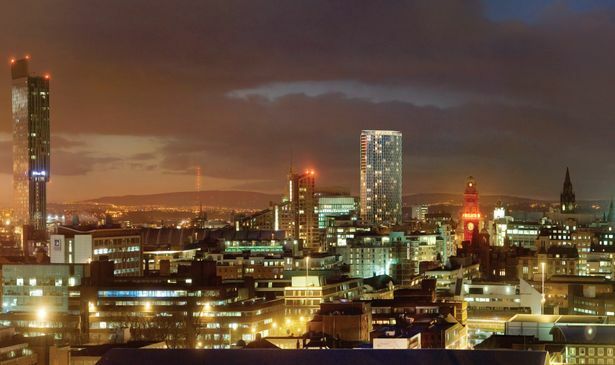 Bruntwood’s multi-phase project has seen serviced apartments and offices – in blocks of up to 37 storeys – constructed at pace, in a scheme that is eventually intended to include new public space and high-tech businesses as part of the Oxford Road science corridor. The development was not without its detractors when it received its first set of planning permission in 2016, with neighbours viewing it as an over-development and Historic England raising concerns about its effects on the nearby Principal Hotel. But two years on, the scheme remains one of Manchester council’s key priorities for this part of the city, as well as for its economy as a whole. It was one of several schemes in this list to have received a loan – in this case £36.3m – from Greater Manchester’s housing investment fund for development on brownfield sites. This colourfully striped behemoth, wedged into an awkwardly-shaped plot next to Deansgate Locks, is now near completion, with ‘topping out’ – the laying of the highest point – due to be completed last week. The luxury development, a partnership between Property Alliance Group and U+I, was granted permission in 2016 and sits opposite the former Hacienda site. When complete, the 28-storey tower will contain 169 two and three-bed apartments, plus two huge penthouses, with prices starting at £300,000. Its developers also promise ‘unrivalled’ 360-degree views of the city and – in common with most up-market developments in the city centre these days – a 24-hour concierge. The giant towers currently under construction around Owen Street, at the end of Deansgate, are now impossible to miss. 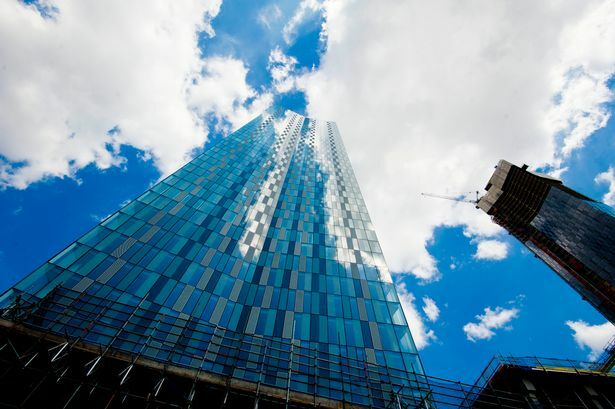 Renaker’s development will eventually see four blocks of luxury apartments complete by 2021, with the tallest – South Tower – topped out last week to stand at 64 storeys, making it not only the highest in Manchester by some way, but also the biggest anywhere outside of London. The Simpson Haugh-designed scheme will include new public space around the Medlock and an array of high-end facilities, including a huge gym, indoor tennis court, sports hall, swimming pool, spa and roof garden. It is also the single biggest beneficiary of the region’s housing loan fund, receiving £70m of its £300m total. Nearly half of these new apartments at the former Origins site on the corner of Princess Street have now been sold to a mixture of owner-occupiers and investors, with the final construction phase having got going in earnest in March. 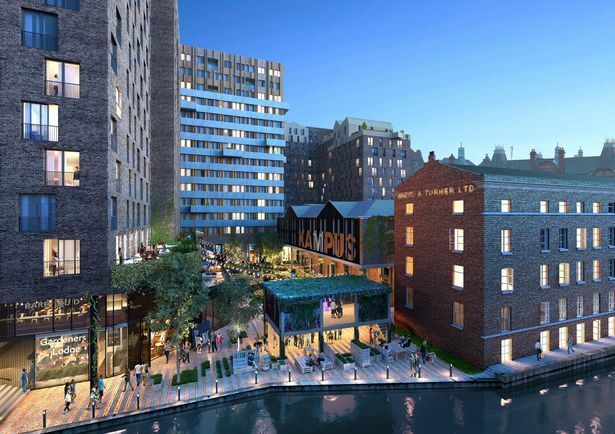 The site – which stood empty for years and at one stage had been earmarked for a hotel – will see a cluster of new flats set over new canal-side eateries and public space, with developer Urban & Civic promising independent businesses targeted at ‘artisan’ tastes. Of those apartments that remain available, prices start at £257,250 for a one-bed on the fourth floor, rising to £477,500 for a three-bed on the thirteenth. Like Deansgate Square and Circle Square, the scheme received a substantial loan – £43.3m – from the region’s housing investment fund. This skyscraper on the corner of Rochdale Road – part of the NOMA redevelopment led by the Co-Op – has hit some hitches along the way. Earlier this year the collapse of construction contractors Carillion its progress forced a pause, but since then work has got back underway. One of the country’s largest build-to-rent projects, the scheme is split between a 36-storey block and a smaller building alongside, featuring 466 ‘premium’ apartments, a gym, cinema, co-working space, roof terrace and 22 sq ft of commercial space. The flats are expected to be available to rent from spring next year. This Salboy project on the corner of Tib Street and Church Street, opposite Affleck’s, caused consternation in 2017 when councillors granted planning permission – due to the forced relocation of the Big Horn sculpture that had previously occupied part of it for nearly 20 years. The development itself will include around 180 apartments, a roof terrace and shops on the ground floor. In recent weeks it has hit a hitch, however, after construction contractor Forrest hit financial problems. Since then it is understood Salboy’s own construction arm, Domis, has stepped in to complete the scheme. Once an iconic Manchester cinema – one of many on Oxford Road’s 20th Century corridor of silver-screen attractions – the 1920s-era Odeon building was finally demolished last year, more than a decade after it closed its doors. Plans for its redevelopment had been circulating for years before they finally got off the ground, in the face of concerted campaigns from conservationists and film buffs. But despite a number of hitches and changes in ownership as various proposals fell through, the most recent vision for the site is now getting off the ground. A new 14-storey office block is springing up in place of the Odeon, courtesy of developers Project Beach Developments, with completion last year said to be due in summer 2019. This new block behind One St Peters Square will contain not one but two hotels when complete. 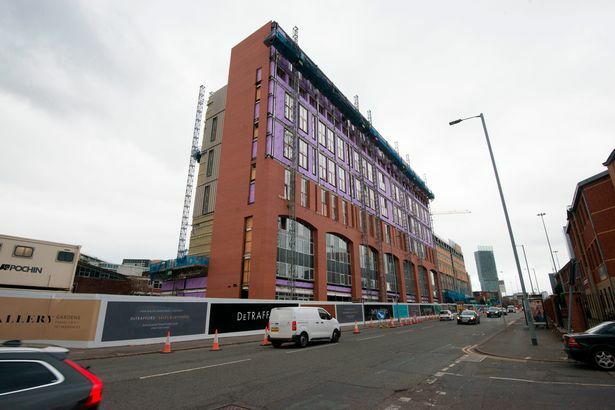 Replacing the derelict Peterloo House block, which has been demolished, the 20-storey tower will feature a Motel One in the first eight floors – containing more than 300 rooms – and a StayCity aparthotel above that. Originally developers Property Alliance had planned offices on the plot, but with new office space subsequently approved for neighbouring plots, they turned their attention to the hotel sector. Effectively the development – due to be complete in 2022 – finishes the regeneration of St Peter’s Square, which has already seen new tramlines and stops, a new cenotaph and the Simpson Haugh-designed numbers One and Two. The start of a vast intended wave of new development stretching north from the city centre out to Collyhurst, work on these two new tower blocks on the edge of Angel Meadows has now begun. Part of the ‘Meadowside’ project – a multi-million pound Chinese-backed scheme that will eventually see a huge 40-storey skyscraper built on the corner of Gould Street – the Gate and Stile blocks will be a mixture of one, two and three-bed apartments, featuring a ‘boutique lobby’ and private dining. Prices currently range from £250,000 for a one-bed to just under £450,000 for a three-bed on the 12th floor. Funders Far East Consortium are not only behind these apartments but are one half of a partnership with the council that intends to redevelop land all the way down the Irk Valley, Rochdale Road and in Collyhurst itself. This canalside project in Piccadilly Basin is one of several aimed at filling in some of the undeveloped parcels of land a stone’s throw from Piccadilly station. 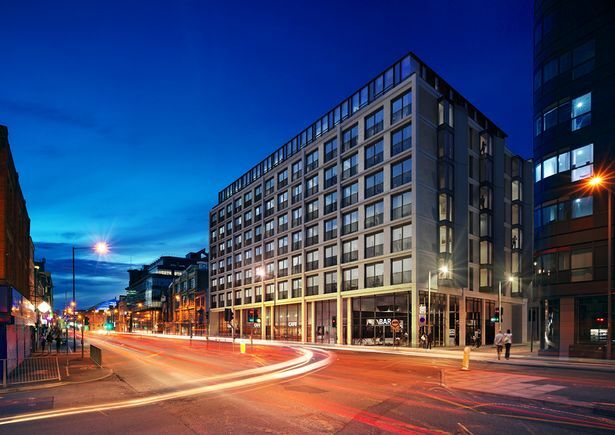 The nine-storey scheme promises luxury stays as part of a chain that already has branches in Edinburgh and Glasgow – and will be seeking to get in early on the opportunities attached to HS2’s intended arrival in the next 15 years. Work on the £25m development has come forward at pace, with opening scheduled for next year. It is one of several new schemes in the area either under construction or in the pipeline. The Linda’s Pantry cafe next door closed its doors earlier this year, ready to make way for an apartment scheme by developers Belgravia Living. 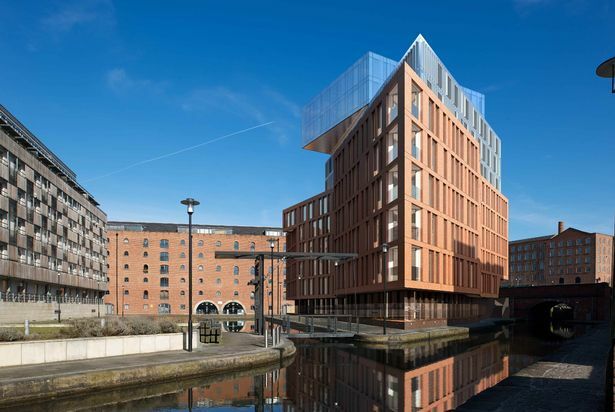 Simpson Haugh designs for this 11-storey residential development on the banks of the Rochdale canal first surfaced in 2014, but took several years to get off the ground. 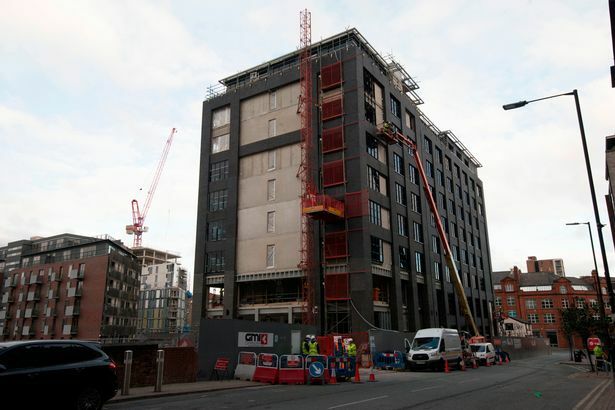 In 2015 the scheme received a loan from Greater Manchester’s Housing Investment fund – the brownfield development pot also used by Circle Square, Manchester Square and Deansgate Square – of nearly £10m, followed two years later by a further £3.5m. The project, by Belgravia Homes, is now well underway, as the council looks to regenerate the surrounding post-industrial landscape ahead of HS2’s planned arrival. When complete in 2019, the development will feature a mix of one, two and three-bed apartments. Not actually under construction yet, this development is nonetheless worth a mention due to its unusually high profile over the last couple of years. 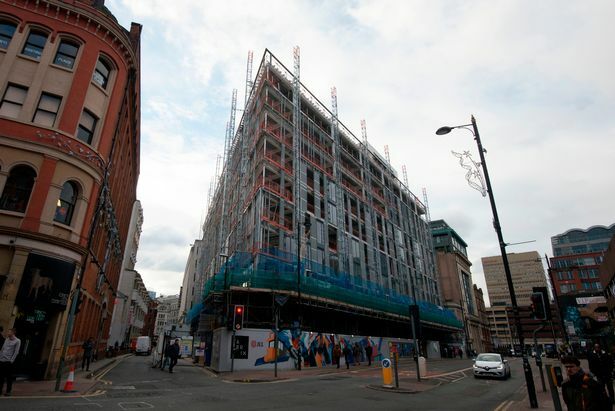 The mixed-use redevelopment of almost an entire street – off Deansgate – by Gary Neville’s council-backed vehicle Jacksons Row Developments had been through several iterations and wranglings with Historic England before finally getting planning permission earlier this year. While work has not so far started on site, a contractor is due to be appointed in the near future, so expect another cluster of cranes to hit this part of the city – a spit from the town hall and a wave of redevelopment coming online around Lincoln Square. One of several major residential projects by developer De Trafford to the south side of the city centre, these apartments off the A56 are due to be complete in May. A mixture of one, two and three-bed flats – including penthouses – and townhouses, the scheme represents part two of the developer’s vision for a string of plots bordering Castlefield. It is now being marketed to prospective buyers, with one-beds starting at £200,000. De Trafford’s next-door Roof Gardens development is already occupied, while the developer’s plans for Great Jackson Street, over the road, are outlined below. This De Trafford development between Hulme, Chester Road and Deansgate Locks forms part of a major council priority for future city centre development around the city centre’s southern gateway. 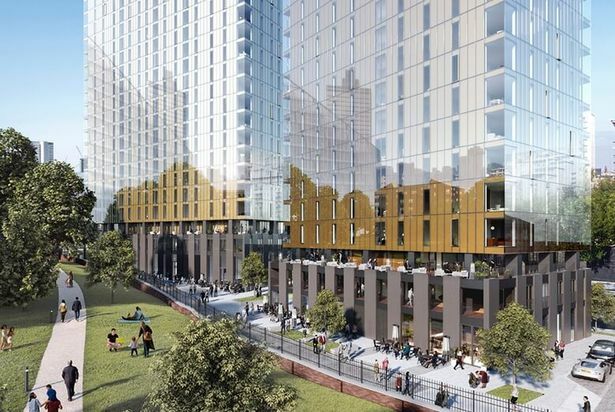 Work on the neighbouring Renaker towers at Deansgate Square is already well advanced and De Trafford’s plans will further add to the town hall’s vision for a new skyscraper alley stretching down to the inner ringroad. 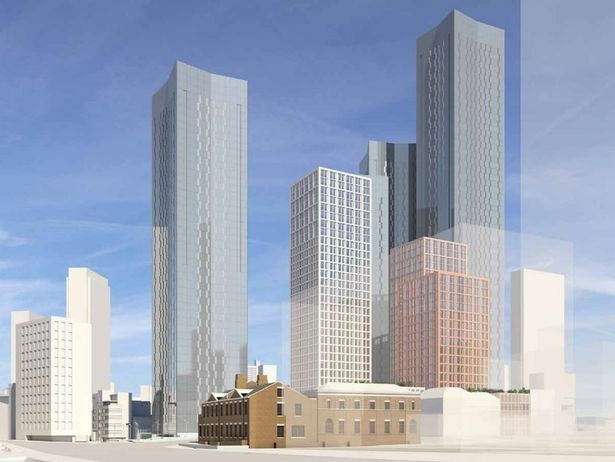 Planning permission was granted earlier this year for its Transition development – three new residential blocks on the former Olympia trading estate, with the tallest due to stand at 32 storeys. In total it will add 399 one and two-bed apartments, plus a cluster of townhouses, to the city centre skyline. Ultimately the council envisages a 6,000-home new neighbourhood will be created in this parcel of industrial land overlooked by the Mancunian Way, much of it ‘build to rent’, according to the masterplan signed off by bosses at the start of the year. Manchester firm Capital & Centric – in partnership with Sheffield developer Henry Boot – have big plans for this block near Minshull Street Crown Court and the Village, on the former Manchester Metropolitan University campus at Aytoun Street. It is ultimately set to become an entirely new neighbourhood aimed at the younger end of the market, featuring bars, new waterside public gardens, co-working space and rental apartments. As part of that, developers are looking to open up a previously hidden back alley called Little David Street, which it hopes to turn into a new boutique cluster of independent eateries and drinking holes. The scheme is currently on track for completion by 2020. This £30m residential development by developers Mulbury, facing the inner ringroad, forms part of the ongoing wave of regeneration to hit the historic Victorian streets around Ancoats since Manchester’s development boom took off. When complete it will provide more than 140 apartments for private rental, in two separate blocks, with a roof terrace and dining area for residents. A mix of one, two and three-bed flats, the project sits on a site that previously housed a substation and car park – further proof that as construction in the city centre continues apace, the opportunities for cheap parking on its fringes are dwindling at the same time. 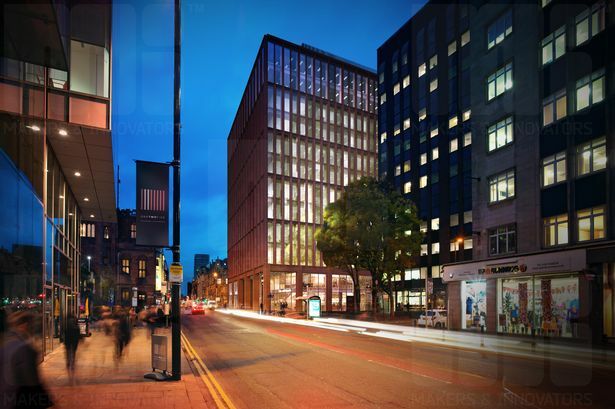 This £70m office development by Worthington Properties replaces the now-demolished Lincoln House, at a prime location opposite John Rylands Library on Deansgate. 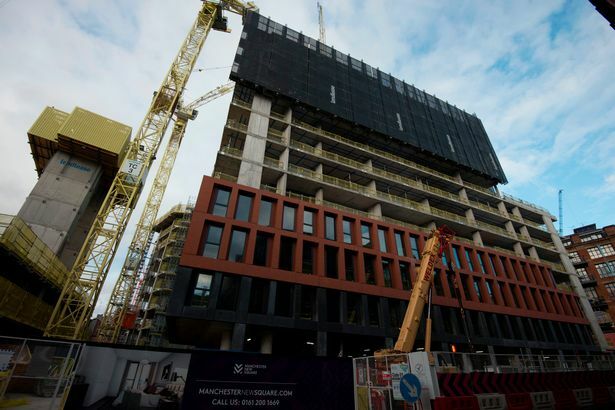 When complete, the new 12-storey block will feature 116,000 sq ft of Grade A office space over the road from Spinningfields, including a roof terace. Space will go on the market from next month, with the development due to be finished in March next year. The only major piece of public realm work currently underway in this list, demolition has already begun ahead of Lincoln Square’s transformation. Manchester council has committed £1.2m to making the plaza a destination in its own right, featuring a new peace garden, trees, upgraded paving and benches. 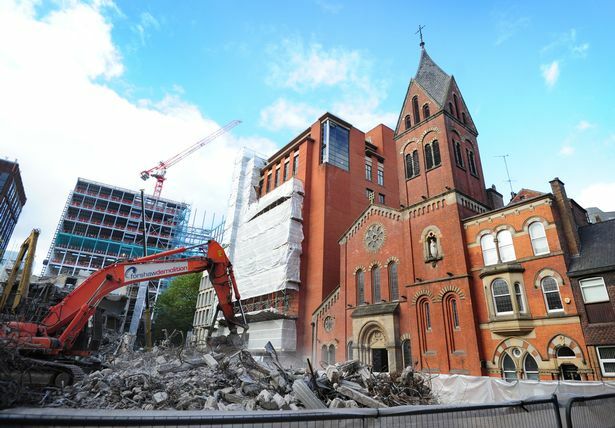 As part of that a cluster of dated office buildings are in the process of being demolished, opening up views of the ‘Hidden Gem’ church to make it not-so-hidden. 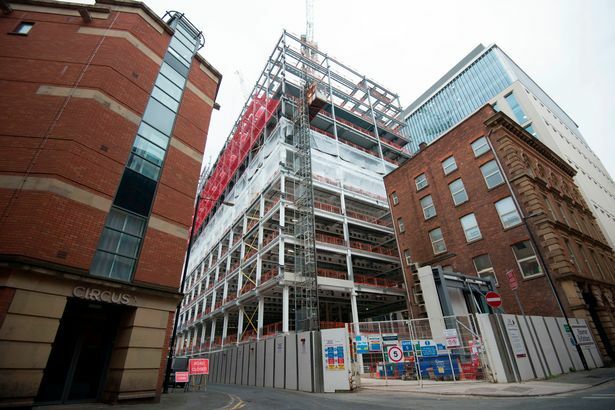 At the same time £3m in private investment is going into upgrading much of the surrounding commercial real estate such as Brazennose House, around the corner from the forthcoming 125 Deansgate. The vast St John’s quarter planned for Quay Street’s old Granada Studios site is starting to get underway, including site clearance for the Factory arts centre, above. When complete, the area as a whole will feature a cluster of high-end residential skyscrapers, converted warehousing, co-working space, new offices and at least one hotel, with the aim of constructing a brand new ‘creative’ neighbourhood from scratch. Most of the project is in the hands of Spinningfields developer Allied London, which has begun site clearance for the ‘Tower’ – a 54-storey mainly-residential behemoth that will become the second-tallest building in the city when complete, after Renaker’s 64-floor South Tower at Deansgate Square. Work on converting and expanding the 1960s ‘ABC’ buildings has also started, with the scheme already part-occupied. The £130m Factory, meanwhile, is running two years late and £19m over budget – but work to prepare the ground has also started.